Product prices and availability are accurate as of 2019-04-14 07:41:27 UTC and are subject to change. Any price and availability information displayed on http://www.amazon.com/ at the time of purchase will apply to the purchase of this product. Additional attributes includes: adjustable polarity on the photovoltaic panel to alter direction of electric motor turning, retractable robotic head which could be swiftly kept in the top body, the robotic head could be mounted in the front, top or back of the transmission, as well as a transparent real estate to see the movements of the gears. For ages 10+. The solar powered robot can be transformed into 14 different robot modes which include a multitude of comical and functional movements. The user can easily change from a wagging-tail, running beetle, walking crab, surfer, speedster or to a 'zombie chaser'. The robot kit provides unique accessories (included) and parts that make the robot move on land and water. With alternative energy playing such a pivotal role, there is no better time than now to start children on the path to learning basic concepts behind these technologies Fortunately, this product is powered by the sun, so there are no batteries required. The robot moves in the direct sunlight and allows children to create and use their infinite imagination. 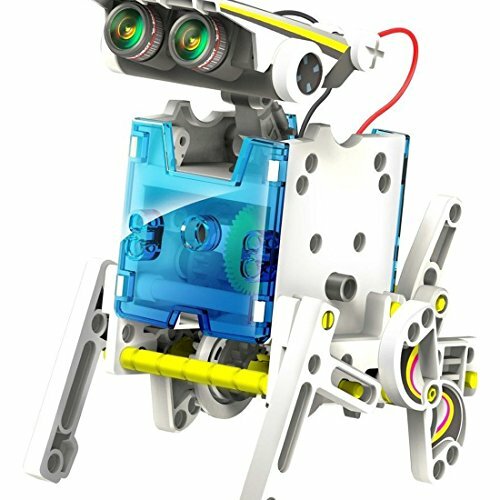 There are two levels in building the robot kit. Level one includes: Turtle-bot, Beetle-bot, Quadru-bot, Boat-bot, Walker-bot, Dog-bot, and Wheel-bot. After they amuse themselves with the entry level, can challenge their manipulative skills with second level: Roly Poly-bot, Auto-bot, Slither-bot, Surf-bot, Zombie-bot, Crab-bot, and Row-bot.